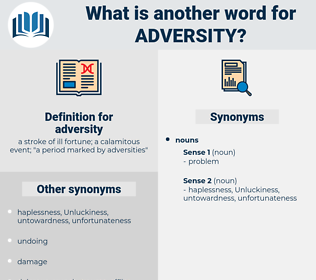 What is another word for adversity? a stroke of ill fortune; a calamitous event; " a period marked by adversities"
downturn, distress, predicament, plight, calamity, hostility. ordeal, misery, difficulty, disaster, setback. contentment, happiness, advantage, assistance, boon, help, pleasure, favor, wonder, miracle, ease, peace, comfort, success, good fortune, aid, encouragement, profit, prosperity, blessing, health, joy, good luck, fortune, benefit. 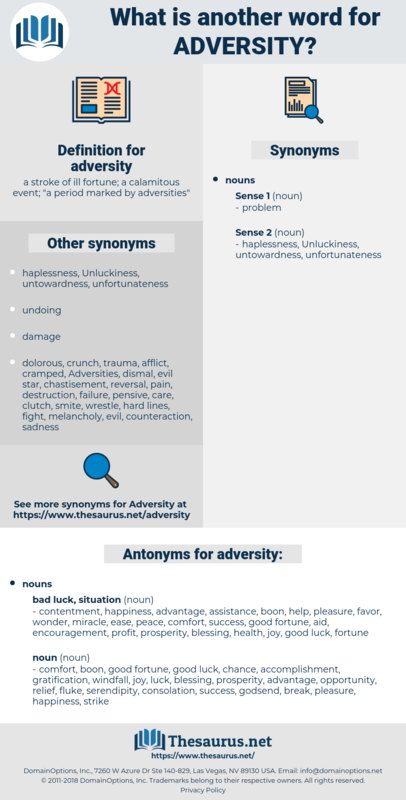 consolation, strike, gratification, opportunity, luck, chance, godsend, triumph, relief, accomplishment, serendipity, achievement, windfall, break, fluke.
" Adversity" - poor Griselda faced it in the tale. But goodness must not lead you into the committal of an act you must and will repent to your dying day; or if it does, I who have learned my duty in the school of adversity, must show the courage of two and forbid what every secret instinct of my soul declares to be only provocative of shame and sorrow. disaster, victimization, low-water mark, nadir, ill-being, distress, catastrophe, extremity, affliction. ill luck, bad luck, tough luck, misfortune.